The Top Five Benefits to Taking High School Classes Online | The Pinnacle P.O.V. With the evolution of current technologies both inside and outside the classroom, it’s no surprise that we are seeing an increase in the number of students enrolling in online classes. In recent years, schools saw over 1 million K-12 enrollments in online courses, and by 2019, it is estimated that 50% of all classes taught will be delivered online. It is no longer a foreign concept to think about getting an education in a virtual environment. Platforms such as Skype and YouTube, and social networks such as Facebook and Twitter are turning today’s 21st century learners into full-fledged digital natives. Whether we like it or not, these technologies are revolutionizing the way we communicate and greatly impact every aspect of our lives, including our education. Today’s classrooms are no longer bound by brick-and-mortar locations and pre-defined schedules. Students now have the ability to video chat with their instructors online and even watch full lectures over the internet. Classrooms aren’t just a room with desks, chairs and a group of students; now they can be any place with a computer and internet connection. Work at your own pace. With online classes, you aren’t bound by a defined class schedule. You can log in to your classes and work at a time and pace that fits your schedule. More personalized learning options. Since students can take courses online, teachers can now create personalized learning plans that are specifically designed to fit the needs of each individual student. Avoid large class sizes. Classes are now reaching monstrous proportions and student:teacher ratios are bordering on the absurd. To avoid crowded classrooms, you can now enroll in online classes where you can receive more individualized instruction and one-on-one attention from your teachers. Learn important technological skills. Now more than ever, students are asked to be technologically literate when they enter the workforce. In order to prepare you for your desired career path, online classes give you the chance to work with the computer programs and develop the necessary computer skills needed to succeed in your future career opportunities. Recover missing course credits. 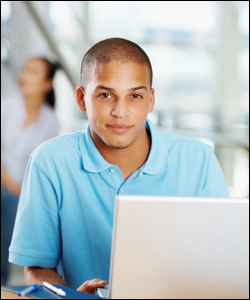 If you have any missing or failed high school course credits, you can enroll in an online high school to make up the necessary credits. Some programs even allow students to enroll in their classes while students attend class at their traditional school. Earning your high school diploma is an important step in your career and is vital for achieving academic and professional success. While technology continues to increase its footprint in the world of education, new teaching models such as eLearning and flipped classrooms are changing the way students learn. Students now have greater control over their learning experience and access to more interactive and engaging resources. It truly is an exciting time for the education space. ~ by pinnaclepov2224 on April 30, 2012.